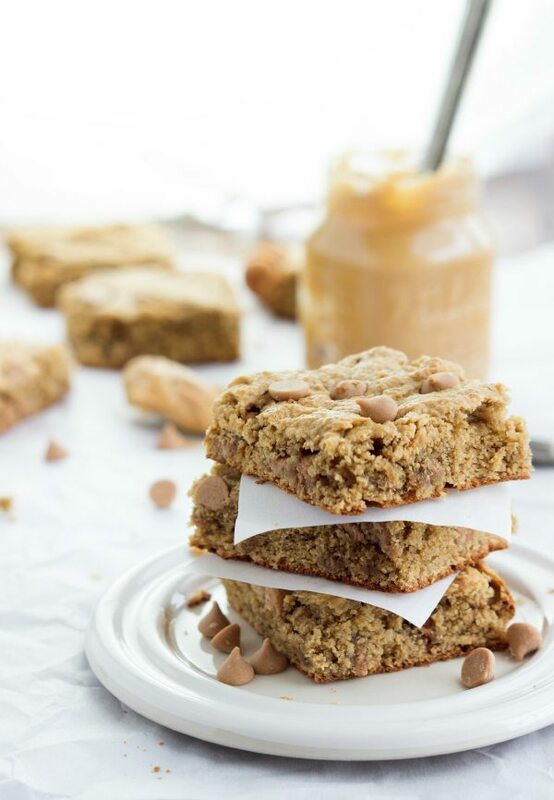 A skinny and delicious version of peanut butter blondies with no butter, no oil, and no flour. 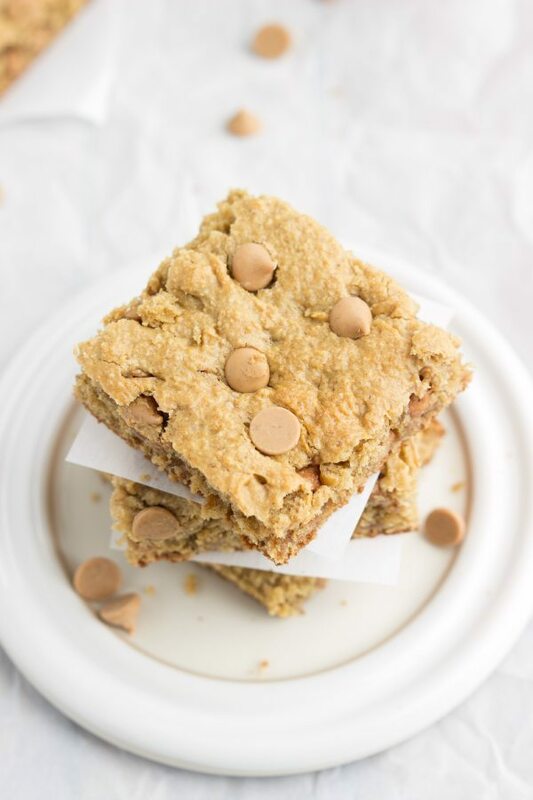 These blondies are also made without beans and with simple ingredients. But it’s also a fact that I like to live a healthy lifestyle and try to have some balance. And other times that balance includes making delicious desserts that are good for me. But also still taste like a dessert. Because that is very important. And so these blondies were born. Not only are they delicious and dessert-tasting, but they are super healthy and good for you. Like minimal sugar here and lots of great ingredients. For instance, oat flour. Which is just oats that have been put in a blender or food processor and blended until they resemble flour. 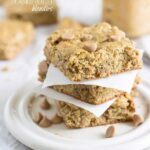 I love oat flour and it adds so many nutrients to these bars. Plus it keeps these bars super soft and chewy. That and the peanut butter. There is some brown sugar in these bars and I have a range that you can put in. More brown sugar if you want sweeter bars and less if you are okay without the extra sugar. I’ve tried these with each range and can honestly say they are all great, but of course the more sugar is sweeter and more dessert-like. Oh, and the peanut butter chips? Do not leave those out. You can switch them out for a dark chocolate or plain chocolate chip, but make sure to add something in because it’s really what makes these bars go from good to great. I mean seriously great. Preheat the oven to 300 degrees F. Line an 8 x 8 baking pan with parchment paper. Allow the parchment paper to hang over the sides to create a way to pull out the blondies from the pan with the parchment paper. Remove the banana peel and mash well using a fork. Measure the banana after it has been well mashed to ensure it is 1/2 cup. In a large bowl, using hand mixers, cream together the mashed up banana, peanut butter (do not warm up), honey, vanilla extract, and brown sugar. Beat until completely combined. Beat in the egg. Bake for 18-22 minutes or until lightly golden brown. Remove and allow the blondies to cool. 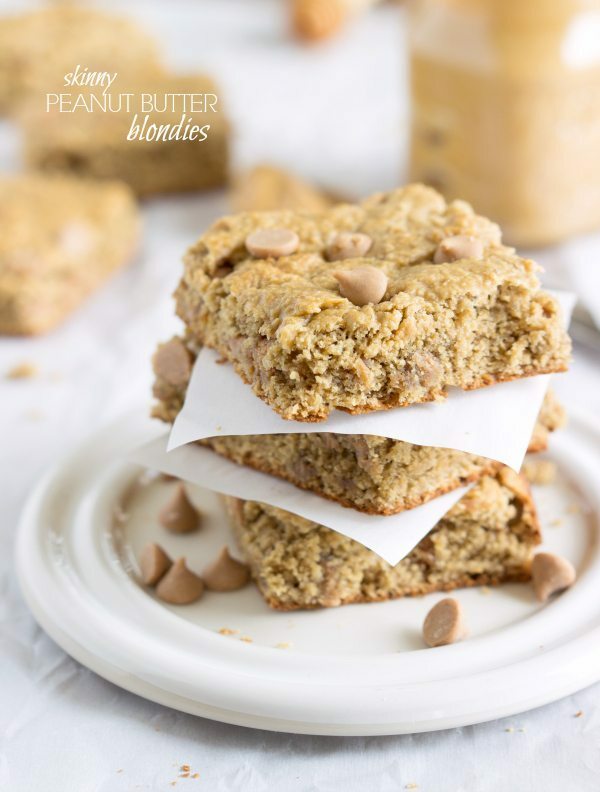 I love a good blonde- especially when there is peanut butter and NO chickpeas…I just can’t get into the chickpea blondie thing. Pinned! Happy weekend girl! Gorgeous pictures, Chelsea! I wish I had one of these for breakfast! I love that these are bean free too! Pinned! Yum! And I love that they’re bean free! You know I love these A LOT!!! Hahaha love that saying about a cookie in each hand! That’s my kinda balance!!! I’m pretty impressed by your healthy baking ninja skills. You rock Chelsea!!! These do not look healthy in the least! I happen to have some too-ripe bananas and wasn’t feeling like more banana muffins/bread…peanut butter blondies, though, sound pretty much perfect! Love these! And I dare not leave out the peanut butter chips ;). Perhaps I’ll add both pb and dark chocolate chips 😉 ooh..or even butterscotch chips that’s been in my pantry for months now. Pinning! I love dessert recipes that are good for you. I’m going to have to try these out! These look absolutely delicious and your pictures are gorgeous Chelsea! I can definitely live with the balance of a pb blondie in each hand! 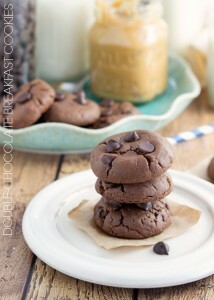 These look delicious and I would never guess that they are skinny and full of such healthy ingredients! Can you taste the banana in here? I’m not a big banana fan, but it seems like the flavor might be masked by the PB! Wow! Can’t wait to make these. I like eating healthy desserts but only when I approve of all the ingredients going in. These are just great. Thank you for sharing them! These bars look fantastic and I love the ingredient list! They would make perfect snacks for the kiddos! Oh this looks soo good!! 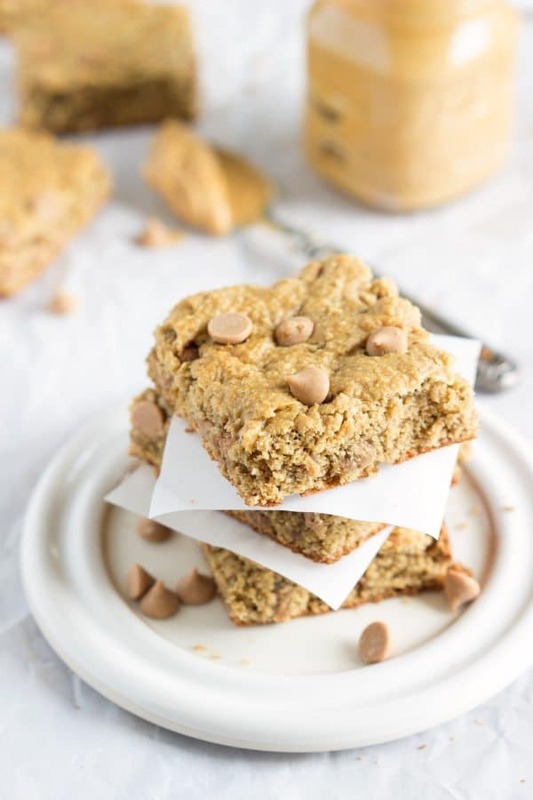 Haha a cookie in each hand sounds good to me – especially if they’re skinny and bean free 🙂 These blondies look amazing Chelsea – love that you added peanut butter chips! Haha I couldn’t agree more 🙂 Thanks Kayle! These blondies look incredible! And since they are on the healthy side, I would be content eating them every day!! P.s. I love that they are bean free! 🙂 Pinned! Made with butterscotch chips instead of peanut butter chips and oh my gahh they are so perfect. The banana caramelized the outer crust of the blondies, simply heavenly. Thank you so much for a brilliant recipe. Will be used time and time again. How strong is the banana flavor? Not overpowering; I definitely taste peanut butter first. If you don’t like bananas, you may not like these though… If you do try this recipe, don’t use a very overripe banana (barely ripe) or the taste will be a strong banana flavor. Hope that helps! Made these last night and they were DELICIOUS! Used Salted Caramel Jif Whips and they were amazing. Thank you! Made these with Bob’s Red Mill oat flour and wow, it was amazing. They didn’t look like your blondies. They were super fluffy instead! Didn’t have any chips on hand and so I used all 4 tbsp of brown sugar. It was perfect! I’ve made so many healthy banana type breads and most are disappointing. Your recipe is finally the healthy recipe I’ve been looking for! Thank you for sharing. That is so great to hear! Thank you so much Judy! 🙂 I appreciate your kind comment! I skipped the brown sugar and added a little extra honey when I made these, like Judy’s they came out really fluffy and absolutely delicious! They have been in my fridge a few days now and still super moist and yummy. Love that they are flour free and bean free. Super easy to make. Will definitely be trying this again!